Here Chadley illustrates another of our popular wagons, and shows another good use. 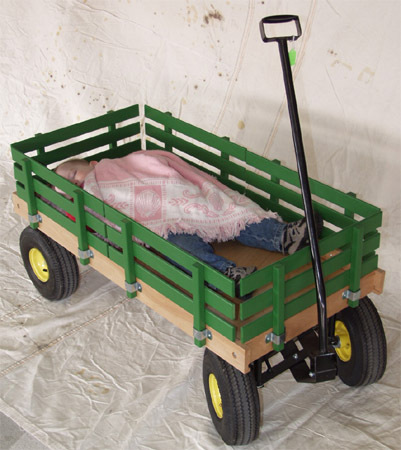 Tired after a long day of waiting on customers, he decides this is a good place to take a break, and points out to parents that with its sturdy sides, non-tip steering and ball bearing wheels with balloon tires that make it easy to pull through a variety of surface conditions, this is the ideal tool to take to parades, parks, picnics or the beach where your kids may need a clean place to crash. Much easier to move around than a mere stroller, this model is built to the same heavy duty standards as our red wagon, but is slightly larger and has a different color scheme.